The photo id for this photograph is 31, in the Trains and Railway Lines album. Brierley Green bridge no. 119, taken in 1902 before the tracks were widened. The locos are Midland Railway ones, the pilot loco being a Johnson 'Spinner' with just the one pair of driving wheels, and the train engine is a slightly more modern 4-4-0. 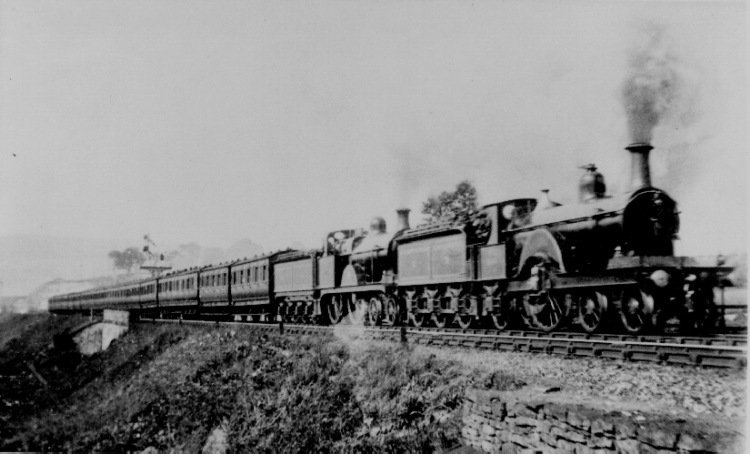 The Midland Railway at that time had a 'small engine' policy, which meant that many trains would be double-headed like this, especially on the heavily-graded Manchester to Derby line. I believe that this photo is at Chinley North Junction..The locos have just passed over the bridge of the road to Glossop at Smithy Bar near the former Crown and Mitre public house. The place is Toll Bar View, Chinley, not Smithy Fold.